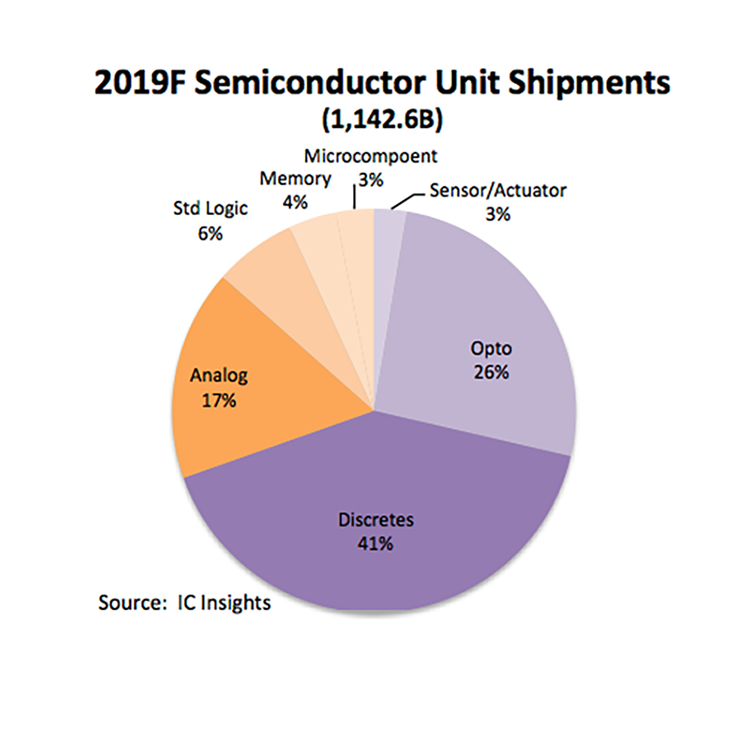 Annual semiconductor unit shipments, including integrated circuits and optoelectronics, sensors, and discrete (O-S-D) devices grew ten percent in 2018 and surpassed the one trillion unit mark for the first time, based on data presented in the new, 2019 edition of IC Insights’ McClean Report—A Complete Analysis and Forecast of the Integrated Circuit Industry. As shown below, semiconductor unit shipments climbed to 1,068.2 billion units in 2018 and are expected to climb to 1,142.6 billion in 2019, which equates to seven percent growth for the year. Starting in 1978 with 32.6 billion units and going through 2019, the compound annual growth rate for semiconductor units is forecast to be 9.1%, an impressive growth figure over 40 years, given the cyclical and often volatile nature of the semiconductor industry. Over the span of just four years (2004-2007), semiconductor shipments broke through the 400, 500, and 600 billion unit levels before the global financial meltdown caused a big decline in semiconductor unit shipments in 2008 and 2009. Unit growth rebounded sharply with 25% growth in 2010, which saw semiconductor shipments surpass 700 billion devices. Another strong increase in 2017 (12% growth) lifted semiconductor unit shipments beyond the 900 billion level before the one trillion mark was achieved in 2018. The percentage split of total semiconductor shipments is forecast to remain heavily weighted toward O-S-D devices in 2019. O-S-D devices are forecast to account for 70% of total semiconductor units compared to 30% for ICs. This percentage split has remained fairly steady over the years. In 1980, O-S-D devices accounted for 78% of semiconductor units and ICs represented 22%. Many of the semiconductor categories forecast to have the strongest unit growth rates in 2019 are those that are essential building-blocks for smartphones, automotive electronics systems, and devices that are used in computing systems essential to artificial intelligence, ‘big data’, and deep learning applications.